*By submitting my email address, I give permission to receive free newsletters, updates, commentary and offers from Harry Dent and the rest of the Economy & Markets team. I may unsubscribe at any time. Over the years, bestselling author and renowned Harvard economist Harry Dent has accurately predicted the dot com bust of the early 2000's, the crash of the U.S. housing market in 2006, the financial meltdown of 2008 and the plummet in crude oil prices in 2015. Now he's back with a bold new forecast - one that calls for gold to take a disastrous dive in price, all the way down to $400. 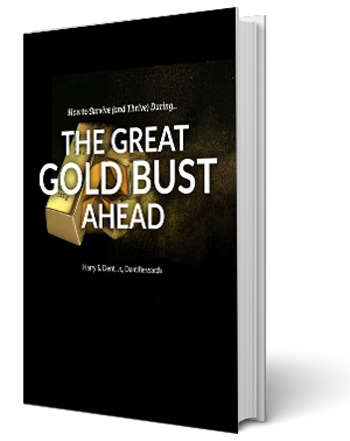 In his brand new book, How to Survive (and Thrive) During the Great Gold Bust Ahead, Harry warns investors that moving their assets into gold isn't the safe haven they think it is. And why it won't protect them from the biggest market collapse since The Great Depression, set to hit by 2018. Due to the time sensitive nature of this material and the historic market crisis already beginning to take hold in the U.S., Harry Dent has agreed to release a limited supply of his new book to you FREE OF CHARGE – electronically. That means you'll be among the first in the world to receive How to Survive (and Thrive) During the Great Gold Bust Ahead the minute it's released. And besides receiving it before anyone else you can get Harry's new book free! This is an extremely limited offer though. And the only way to guarantee your FREE electronic copy is sent is to simply enter your information below. Remember, there is NO COST for this incredibly important expose from the most accurate predictor of major economic events in the world today. And be sure to read all the way to end to learn how to secure more free wealth building and protection resources from the Dent Research team. By entering your details below, you will receive the new e-book immediately...and you will join the 300,000 people already receiving Dent's daily updates through Economy & Markets. Harry S. Dent Jr. studied economics in college in the '70s, but found it vague and inconclusive. He became so disillusioned by the state of his chosen profession that he turned his back on it. Instead, he threw himself into the burgeoning new science of finance where identifying and studying demographic, technological, consumer and many, many other trends empowered him to forecast economic changes. Since then, he's spoken to executives, financial advisors and investors around the world. He's appeared on "Good Morning America," PBS, CNBC and CNN/Fox News. He's been featured in Barron's, Investor's Business Daily, Entrepreneur, Fortune, Success, U.S. News and World Report, Business Week, The Wall Street Journal, American Demographics and Omni. He is a regular guest on Fox Business's "America's Nightly Scorecard." Harry has written numerous books over the years. In his book The Great Boom Ahead, published in 1992, he stood virtually alone in accurately forecasting the unanticipated boom of the 1990s. That same year he authored two consecutive best sellers: The Roaring 2000s and The Roaring 2000s Investor (Simon and Schuster). He published, Spending Waves: The Scientific Key To Predicting Market Behavior for the Next 20 Years (2013), as an information-packed guide for any serious business owner. In The Demographic Cliff (2014), Harry revealed why America is facing a “great deflation” after five years of desperate stimulus — and what investors need to do about it now. In his most recent bestseller, The Sale of a Lifetime: How the Great Bubble Burst of 2017-2019 Can Make You Rich (2016), Harry looks at the upcoming economic crisis and reveals how it could be the single greatest chance to build wealth we’ll ever see and how we can capitalize on the opportunity. In his latest book, Zero Hour: Turn the Greatest Political and Financial Upheaval in Modern History to Your Advantage (2017), Harry Dent reveals why the greatest social, economic, and political upheaval since the American Revolution is on our doorstep. Discover how its combined effects could cause stocks to crash as much as 80% beginning just weeks from now…crippling your wealth now and for the rest of your life. Harry arms you with the tools you need to financially prepare and survive as the world we know is turned upside down! Good news! You are already subscribed to Economy & Markets. As a bonus, we have chosen this exclusive offer just for you.